Epidermoid cysts are slow growing and often painless kind of cysts which rarely cause any problem. They are non-cancerous bumps beneath the skin but most commonly found on the face, neck and trunk. They are mistakenly considered as sebaceous cysts but they are different as they arise from the glands that secrete oily matter that lubricates the hair and skin known as sebaceous glands. In most of the cases, epidermoid cysts cause no long-term problems. Squeezing out the contents of the cysts on your own can lead to an infection, so it is better to leave the cyst alone. Once a cyst is drained, there is a possibility that it will grow back. Very rarely, these cysts can become malignant. Occurs in a spot that is constantly irritated. Cyst is at unusual location such as on the finger or toe. What are the Symptoms of Epidermoid Cyst? A small, round bump on the skin usually on the face, trunk or neck. A smelly yellow and thick material that drains from the cyst. Redness and swelling in the affected area, if inflamed or infected. What are the Causes of Epidermoid Cyst? The surface of the skin is made up of a thin, protective layer of cells that the body continuously sheds. Most of the epidermoid cysts form when these cells move deeper into the skin and multiply rather than sloughing off. Sometimes cysts are also formed due to irritation or injury to the skin or the most superficial portion of a hair follicle. The walls of the cyst are formed by the epidermal cells and then they secrete the protein keratin into the interior. The keratin is a thick yellow substance that sometimes drains from the cyst. This abnormal growth of the cells may be due to a damaged hair follicle or oil gland in the skin. These cysts often develop in response to skin trauma, HPV infection, excessive exposure to the sun or acne. These cysts are more likely to develop in people with acne or other skin conditions. True epidermoid cysts look like sebaceous cysts but they are different as true epidermoid cysts result from the damage caused to the hair follicles or the outer layer of the skin. The doctor will examine the bump and surrounding skin as well as take a medical history. Skin biopsy is performed for detailed analysis in the laboratory. The cause of epidermoid cyst according to Ayurveda: The three doshas contaminate the muscles and blood, fat, vein and blood vessels which cause an elevated swelling which is rounded and knotted (clotted). Such swelling is known as Granthi in Ayurveda. 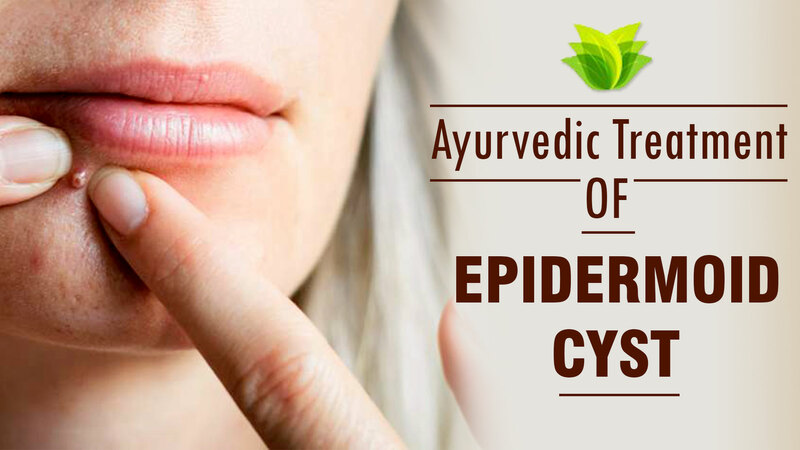 Treatment of epidermoid cyst by Planet Ayurveda includes the prescription of herbal remedies that help in removing cysts naturally without causing any side effects. Kanchnar guggul is an Ayurvedic medicine prepared from the herb Kanchnar bark (Bauhinia variegata). It is a famous Ayurvedic medicine for treating the nodules of neck, tumors, extra-growths, wound healing, skin diseases and many other ailments. It also contains Triphala which is considered as detoxifying for the whole system. 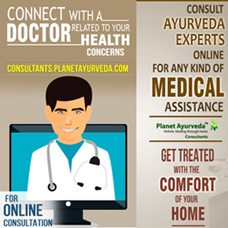 Navkarshik Churan of Planet Ayurveda is an herbal formulation which helps in correcting metabolism and removes toxins from the body and helps in correcting the metabolism of “Pitta” and heat regulation in the body. It is also considered as an anti-inflammatory thus acting as an effective formulation for the patients of epidermoid cyst. Dosage: 1 teaspoon of powder twice daily. Arogyavardhini Vati is a common ayurvedic medicine widely used for the treatment of skin diseases, liver problems, etc. It clears toxins from the body and improves digestion power. It balances all the three doshas in the body. Nirgundi herb is widely used to deal with pain, swelling and discomfort. External application of Nirgundi oil is used to relive boils, various skin disorders and to reduce size of external growths. How to use: Apply on the affected area twice a day. Placing a warm and moist cloth over the area to help the cyst to drain and heal.